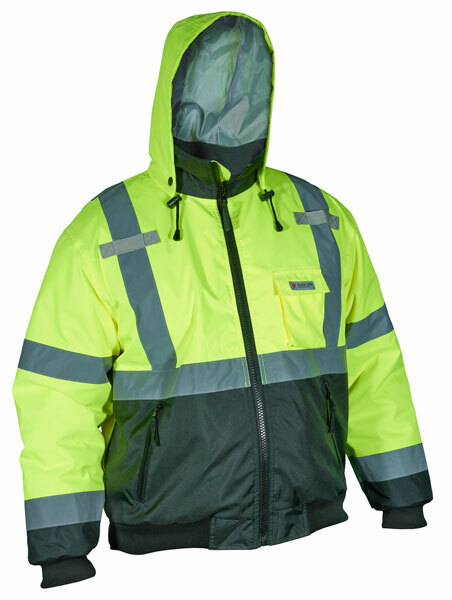 For those applications where being seen is of the utmost importance, MCR Safety's Luminator™ Series offers you a variety of high visibility garments to fit your specific applications. The VBBCL3L is our value series ANSI/ISEA Class 3 Bomber style jacket that features a bright fluorescent lime background color for daytime high visibility and 2” silver reflective stripes for low light visibility. The black shading on the lower front and arms is dirt masking and extends wear life. The black fleece inner liner not only helps keep you warm, but adds an element of comfort that you will enjoy wearing. Other features include a detachable drawstring hood with pull stops, zipper front closure, two front zipper pockets, chest cell phone pocket, and left and right side mic-tab holders. Three inner pockets offer additional storage for belongings.